Just who are Coltana, and what do they want? 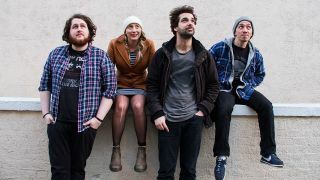 This week, we meet new band Coltana, who talk us through their blistering blend of modern punk-rock, and tell us why “trashing it out on stage is better than punching someone in the face”. Hello, Coltana. Introduce yourselves – who are you, and who does what? Hey TeamRock! We are Coltana, a rock band from Brixton, London. We are Cat on vocals, Baj on guitar, Gordon on bass and Hugo on drums. What’s the story behind how you got together? Well, Cat & Baj were in a band called Poeticat. It was more folky and experimental. We got interested in heavier sounds so we formed a rock band, called it Coltana, and Gordon and Hugo joined. How long have you been playing together now? It’s rock with alternative, punk, grunge and pop influences. What are your key inspirations/influences? Mastodon, Skunk Anansie, Sick Of It All and Rage Against the Machine. Can you talk us through what you’ve recorded/released so far? Sure! We have recorded about 11 songs and are releasing them as singles at the moment. Our debut was Bitter Sweet, which is a kind of love song about the tension between loving someone and wanting to keep your identity. Secondly we released Pressures which is about wanting to escape London and find a place that is less judgemental. You’re just about to release new song Break Her. What’s the story behind that song? Break Her is about jealousy. It is about feeling in competition, feeling like you’re not going to win. It’s about the society setting women up to compete for men’s attention and feel that their only worth comes through a man finding them attractive. What drew you to covering the themes on the song? It’s something that isn’t talked about much. We’re not supposed to feel jealous but we live in a competitive system so obviously we do feel it. It was a contradiction that made me feel angry. A lot of stuff that makes me angry ends up in our music. Better to trash it out on stage than punch someone in the face! We have another single coming up after this. It’s epic! We’re really excited about it. We’re playing lots of live shows as always – that’s what we’re in it for. Got some international gigs lined up which is always fun. Just keeping writing and playing and recording – the circle of life! Break Her is due for release on 19th May via Poeticat Presents. New Band Of The Week: Dead!